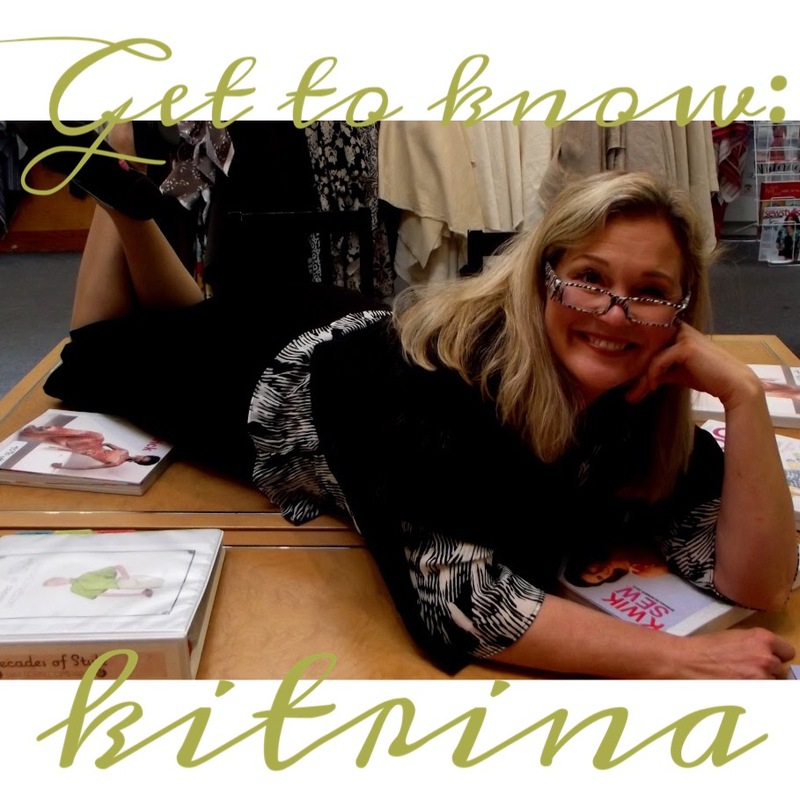 Today we “get to know” our talented and prolific assistant store manager for Nancy’s Sewing Basket! She is the person responsible for the incredible 1927 Cloud Cape that we featured earlier this year. 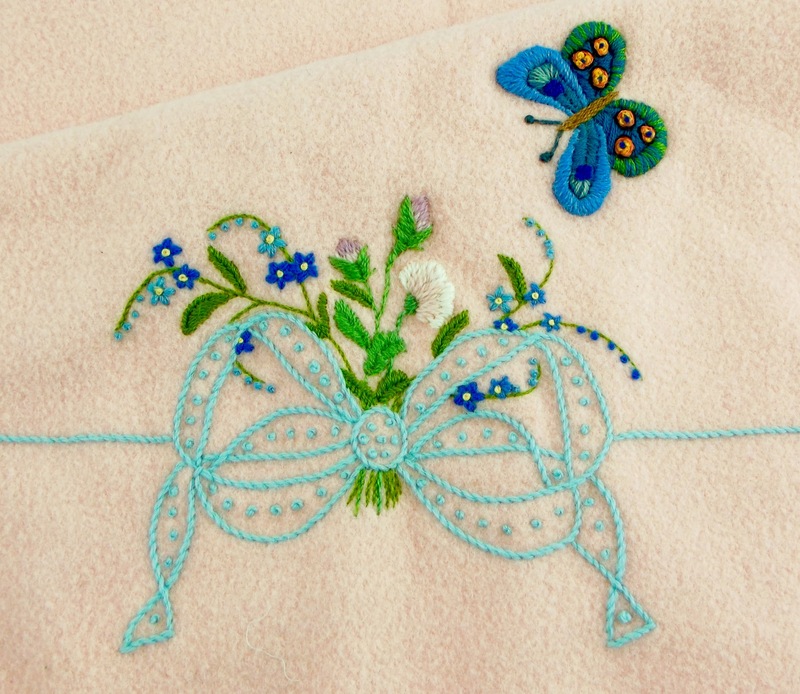 She also teaches our fabulous embroidery class: Hand Embroidery Basics! Who are you? Hi! I’m Kitrina. How long have you worked at Nancy’s? I started when my youngest went to kindergarten. She turned 21 last week, so I’ve been with the store for 16 years. 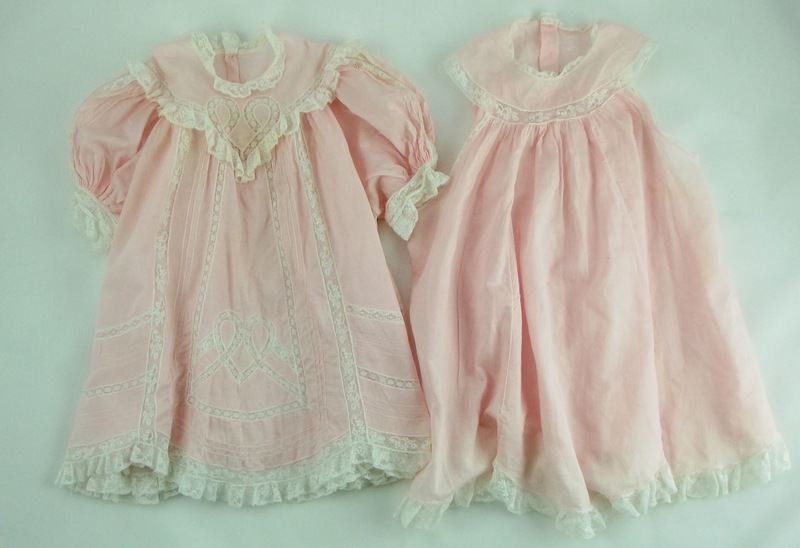 Although, before she was even born, I taught smocking classes at Nancy’s when we still had a classroom space. 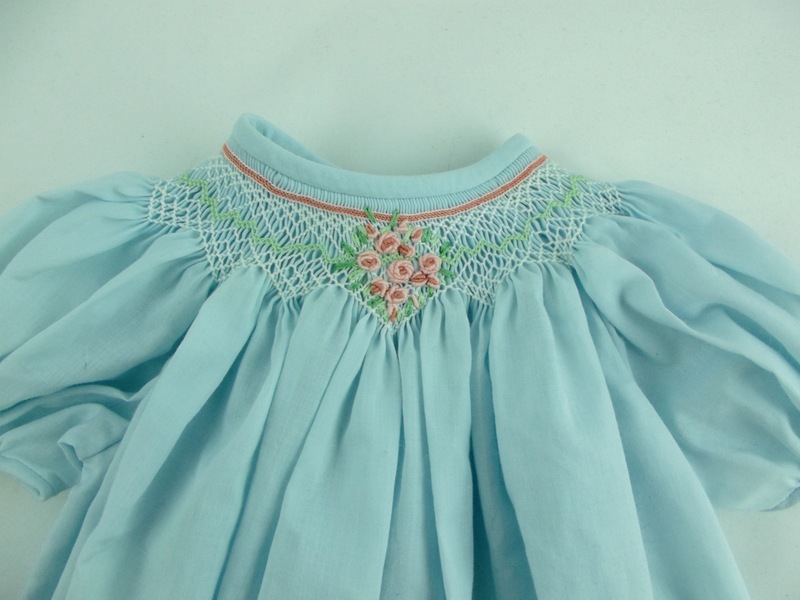 A smocked dress, with detail. 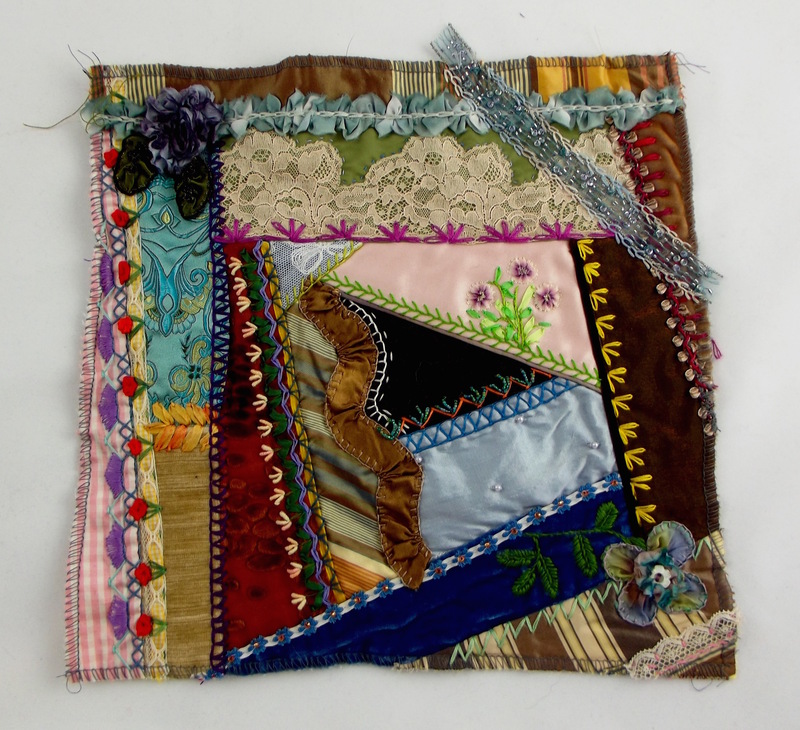 I’ve been sewing since I was six years old. I’m adopted and my family of origin didn’t really keep stuff, but creating keepsakes for my own family gives me a charge. 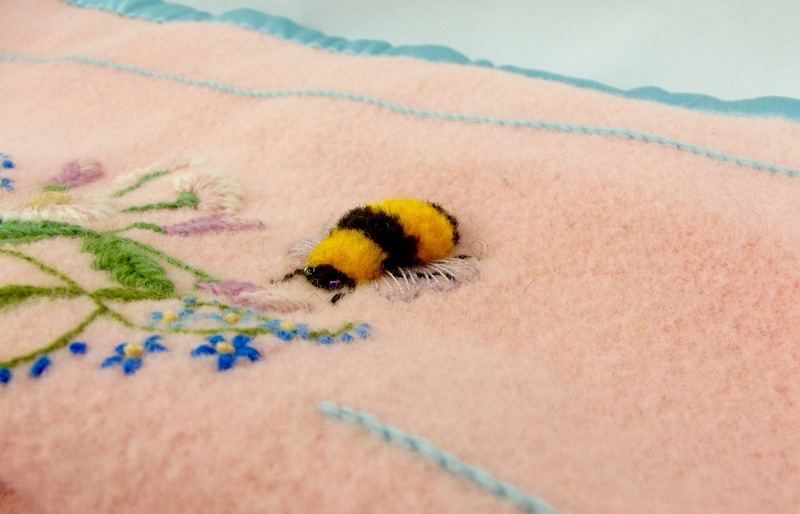 I have this embroidered piece that my great-grandmother made when she was eight. I put my spirit into the things I make, hoping that my work will keep me alive long after I’m gone. 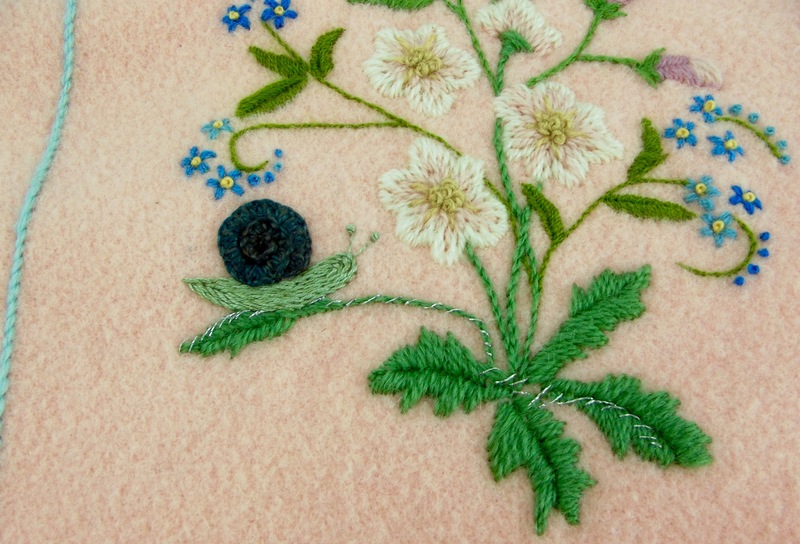 I’ve had several focuses of interest, including heirloom sewing, smocking, and different kinds of embroidery, including crewel work. 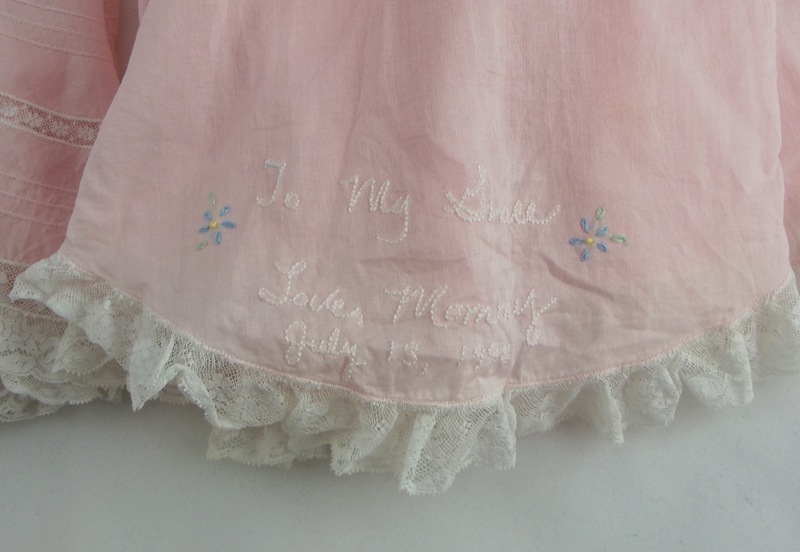 The hand embroidered inscription on the gown lining. 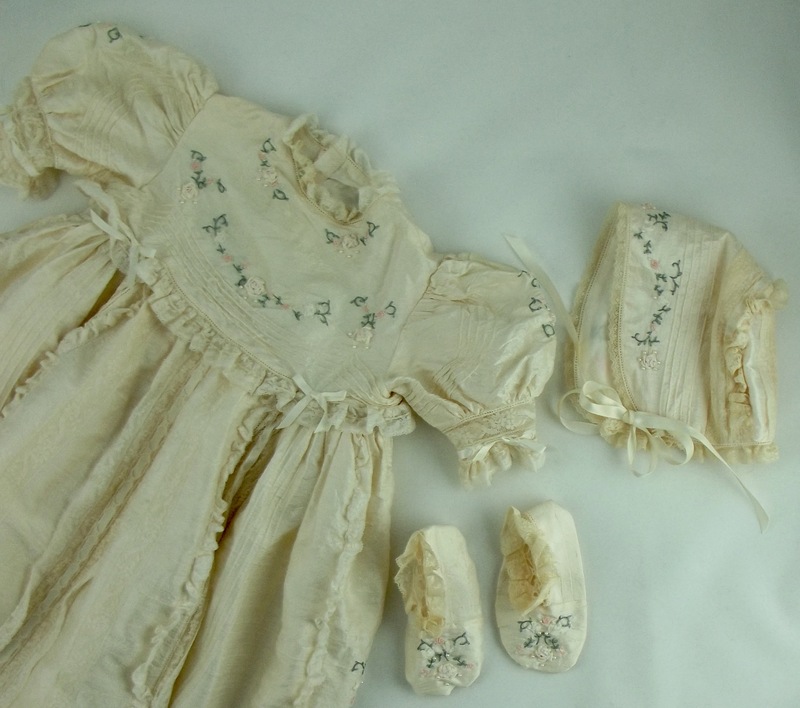 The full set: christening gown, bonnet, and booties. 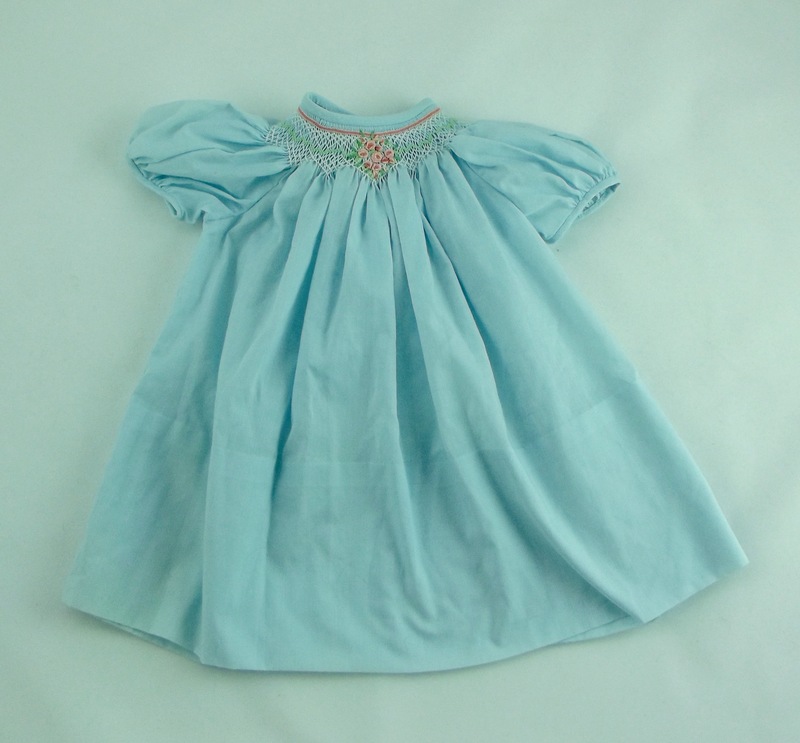 A cotton dress and under-dress featuring heirloom sewing techniques and trimmings. 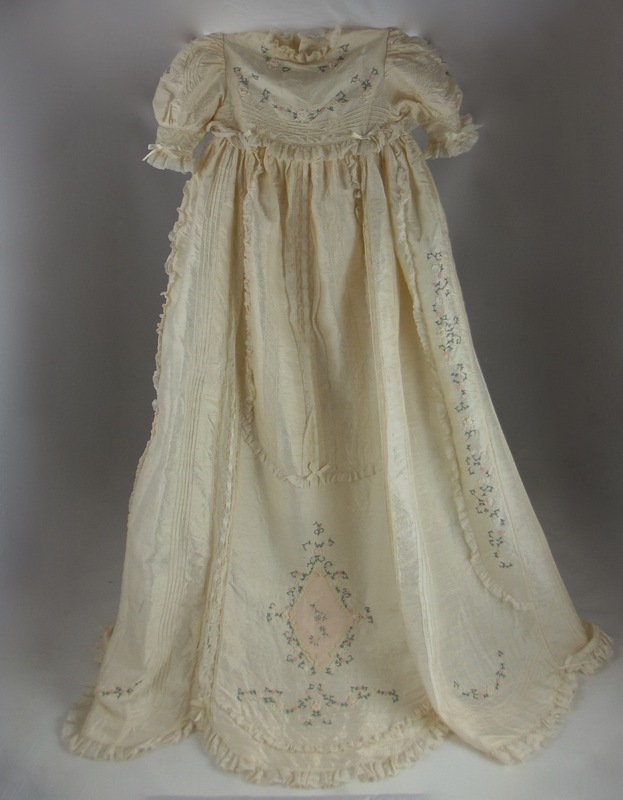 A sweet embroidered inscription on the under-dress. 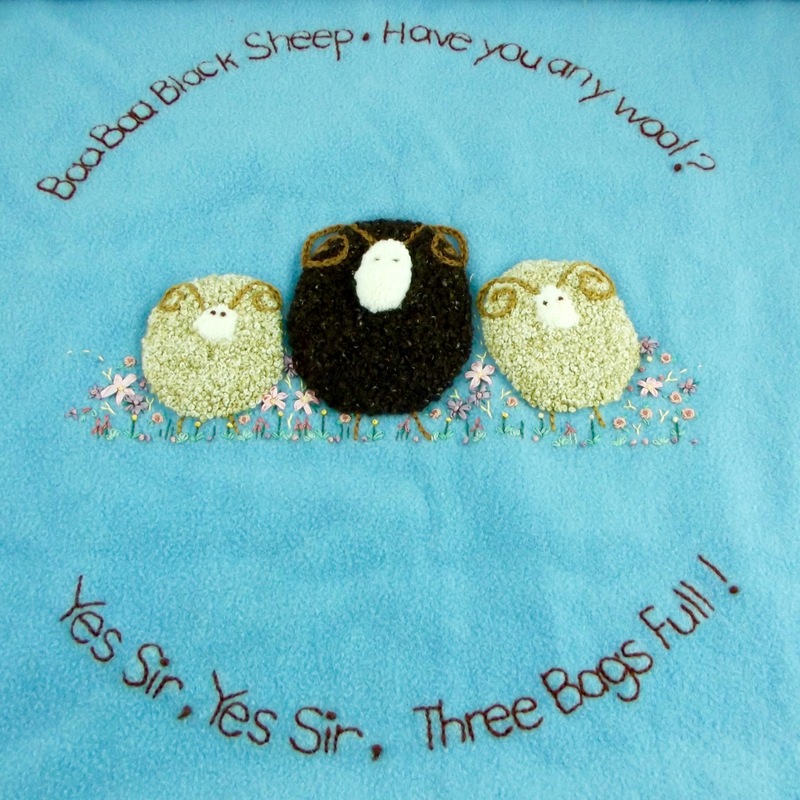 A fun example of crewel work with applique and embroidery. 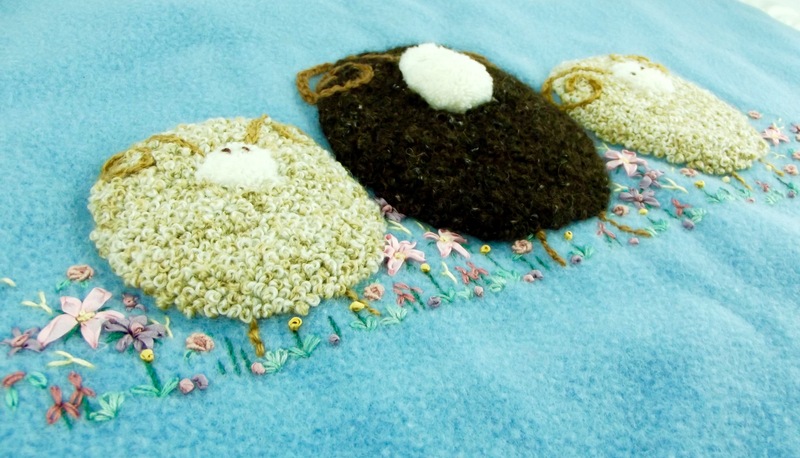 The bodies of these incredible sheep are made from french knots! Another blanket featuring crewel work. This bumble bee is three dimensional! Check out that glistening snail trail! 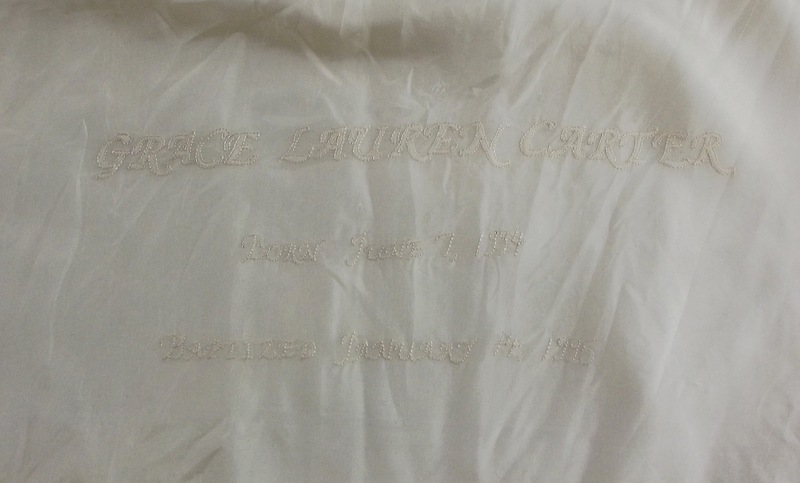 Pre-printed pillowcases that my aunty gave me to embroider. She said, very seriously, ‘you can embroider these and give them to me for Christmas,’ which I did. This arrangement continued for many years until the one time I didn’t give them back and she stopped providing them to me. They were a great way to keep my hands busy. I take on projects for clients and I recently completed custom construction and alterations for four different brides. It was a fun and exciting spring wedding season, but I’m happy to have more time to work on other projects. 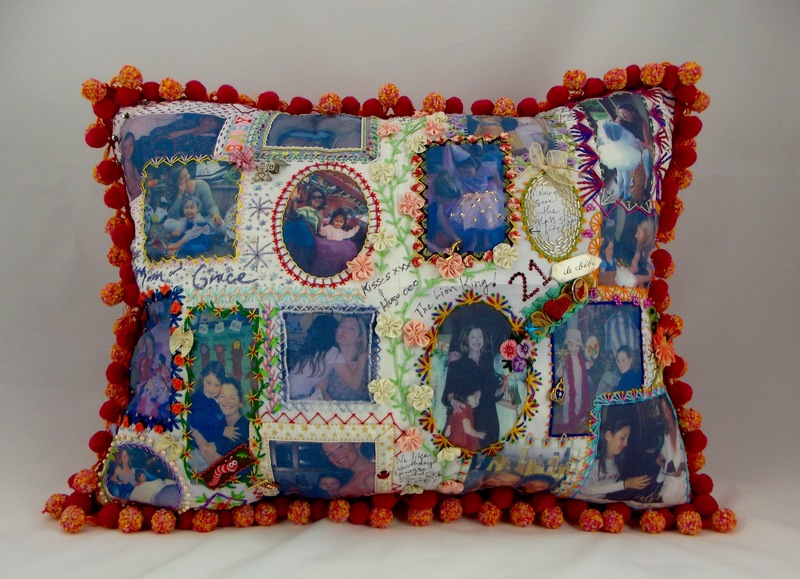 In my personal work, I recently created a keepsake memory pillow for my daughter’s twenty-first birthday. She had asked for us to have our portrait taken together, but I wasn’t really feeling it. Instead, I found lots of pictures of us from her lifetime (special thanks to my husband for always having a camera around! ), which I printed onto fabric and then embellished with handwork. 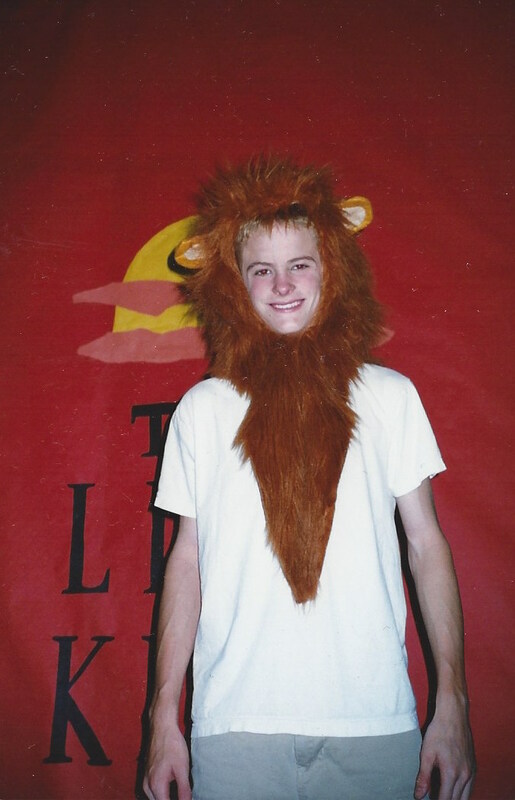 Most memorable was the first play that I costumed: The Lion King, for a local school. I’d never really done something of that scale before – there were 40 students in the production and zero budget. I soft sculpted headdresses out of fabric to make giraffes, elephants, a zebra, the lions, Rafiki the baboon, Timon the meerkat and Pumba the warthog, the three hyenas, and a chorus of singers. It was all very effective. 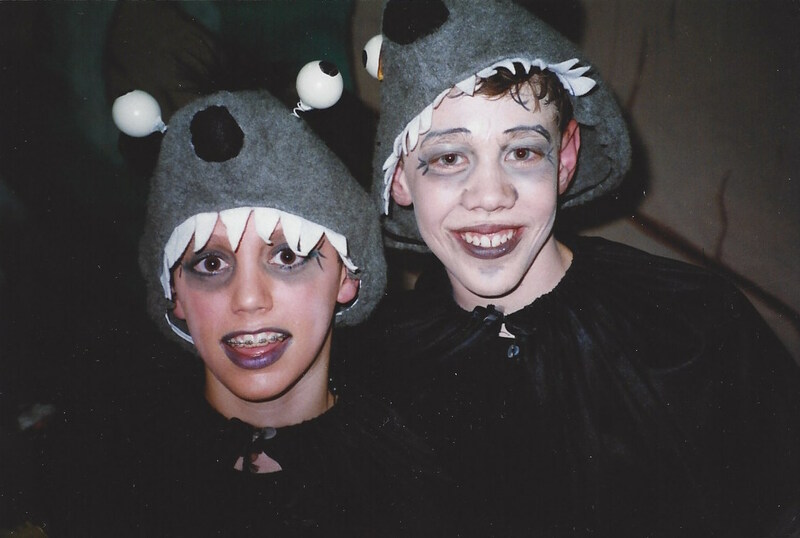 Two of the three hyenas. Kitrina put Ed’s eyeballs on springs so they were especially erratic looking (on the left). 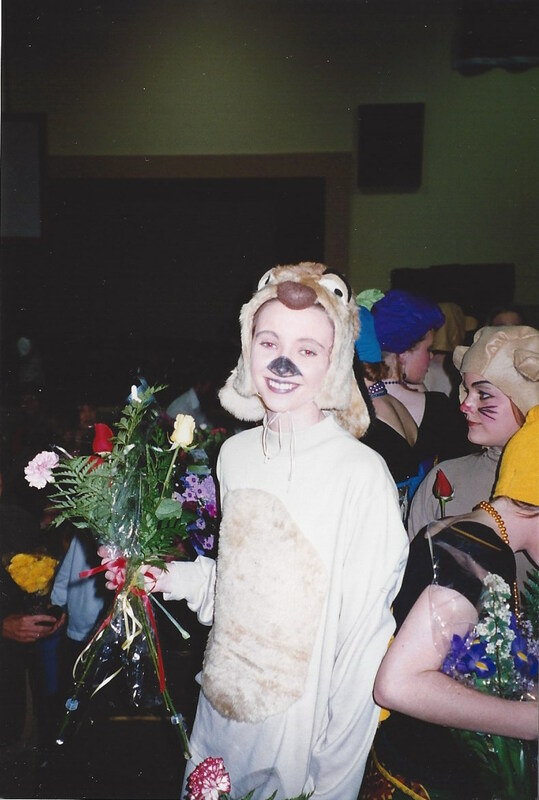 Timon was a favorite costume. In my personal work, I have a number of favorite, ongoing projects. I make boxers for my sons using the Italian shirting cottons offered at Nancy’s (I don’t think my sons have worn store-bought underwear since they were children). The quality of the fabric is incomparable; the elastic breaks down and the thread wears out, but the fabric remains intact. It’s awesome. 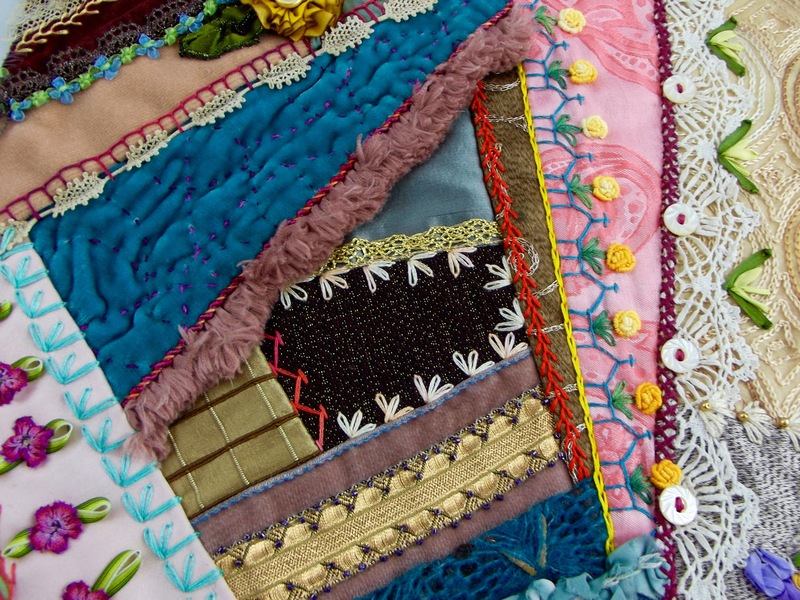 I also have eighty 10” x 10” crazy quilt squares that I work on little by little. 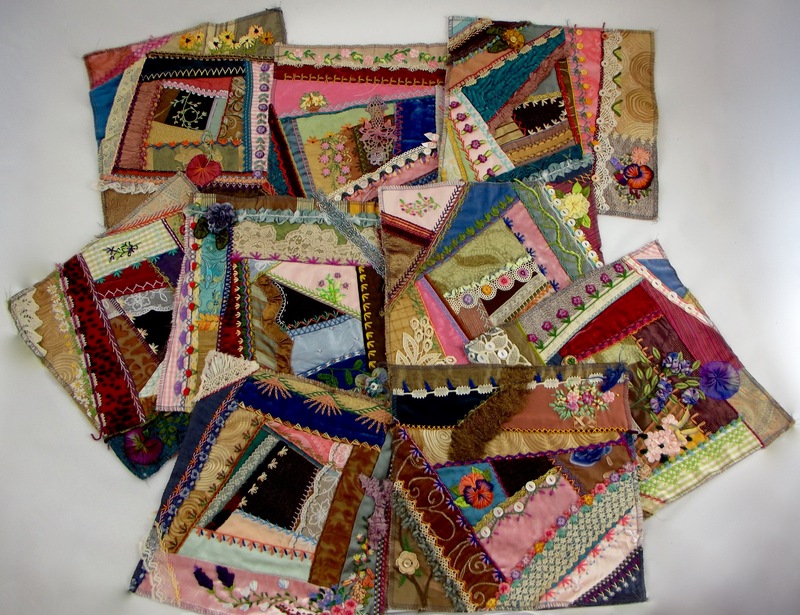 My intention is to make the squares into four different throws: one quilt for myself and one for each of my three children. 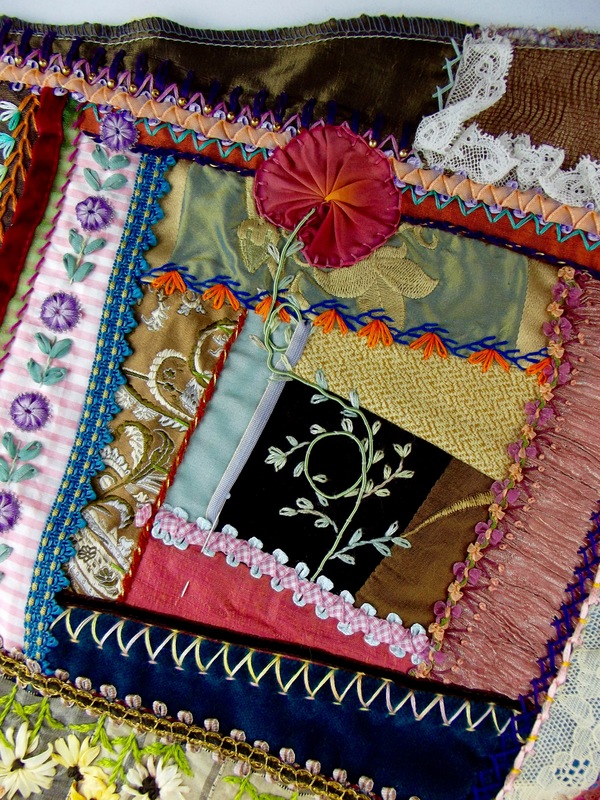 Working at Nancy’s over the years, I have had opportunity to collect beautiful scraps of fabrics. 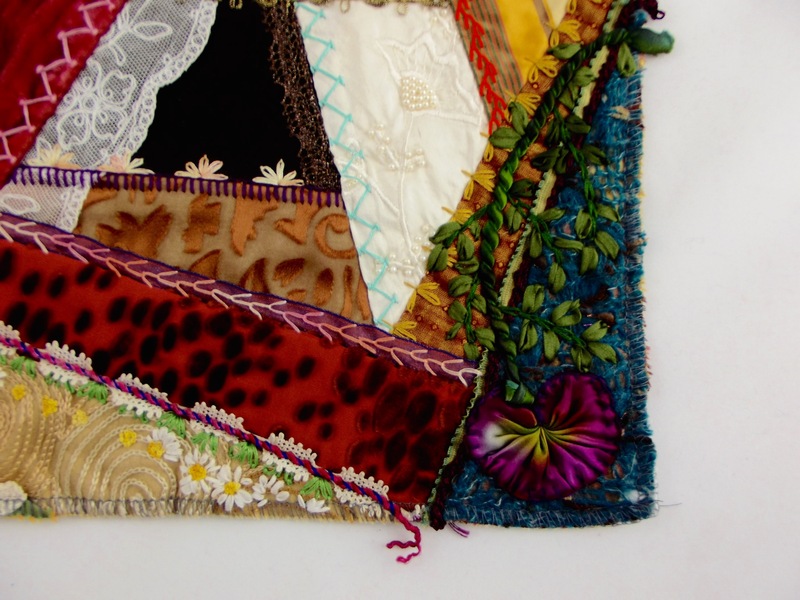 One of my favorite things about crazy quilts is that small scraps are very effective. When I decided to start working on this project, I went through my stash and started pulling anything in a palette of browns, golds, soft blues, and pinks. 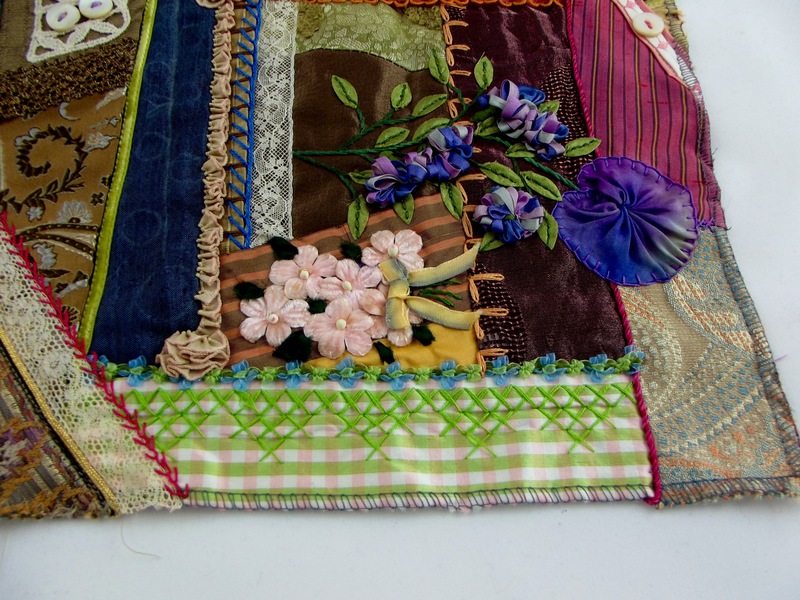 I began each block with a brown center, and then built around it with fabrics and embellishments. A single block, chosen at random. The brown center provides a subtle foundation for the embellishment and colors surrounding. I work on a block until I’m tired of looking at it, then move on to another. 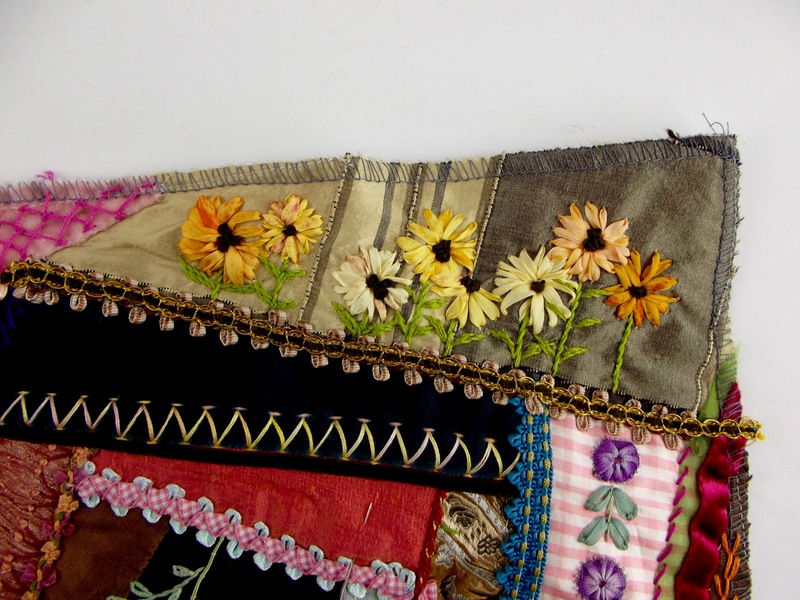 Sometimes I will ‘audition’ a trim or an embroidery motif to decide if I like it; on occasion, I remove an embellishment. A beautiful iridescent chiffon gown for a Mother of the Groom. I am using a muted palette of mossy greens and soft golds. It’s for a destination wedding in Napa Valley. It is going to be such a fabulous event and I’m happy to be making something so incredible for it. For myself: a new summer wardrobe! I am in love with the tunic pattern that is used in the DEF class and I’m currently working on renditions five, six, and seven. The visual beauty of the store; it’s very nurturing to my spirit. And the women friends. I also really appreciate the owner of the store; it’s nice that they appreciate their staff. Thanks so much to Kitrina for sharing her gorgeous work with us! Any questions for her? Leave them in the comments! All photographs in this post are courtesy of Nancy’s Sewing Basket employee Kitrina and may not be used without express permission. 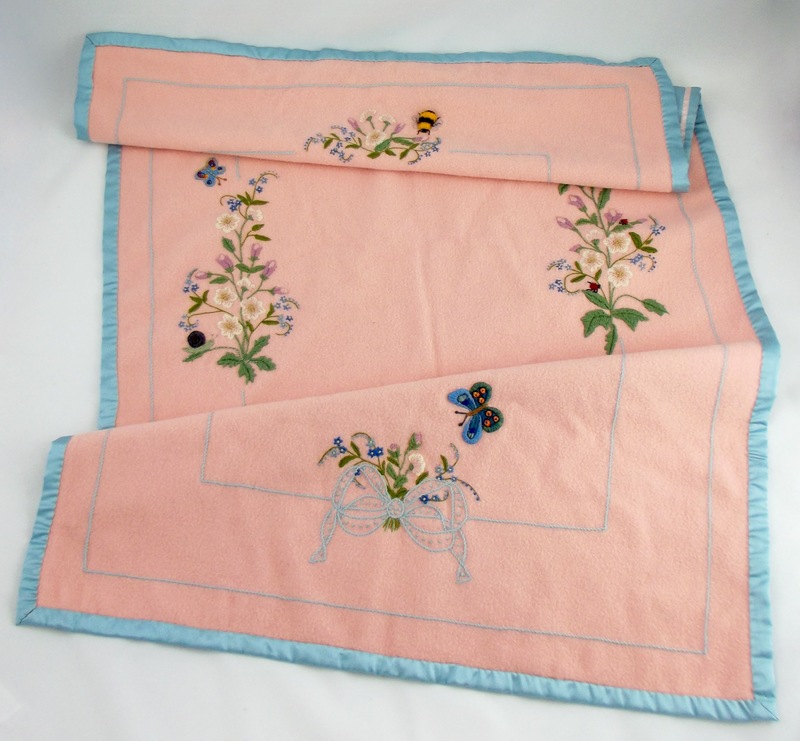 This entry was posted in NSB Interviews and tagged crewel work, embroidery, get to know Nancy's employees, handmade, handsewing, heirloom sewing, interview. Bookmark the permalink.